​During World War II, as Adolf Hitler's awesomely powerful Wehrmacht rampages across Europe, the Prime Minister of the United Kingdom, Neville Chamberlain, is forced to resign, recommending Winston Churchill as his replacement. But even in his early days as the country's leader, Churchill is under pressure to commence peace negotiations with the German dictator or to fight head-on the seemingly invincible Nazi regime, whatever the cost. However difficult and dangerous his decision may be, Churchill has no choice but to shine in the country's darkest hour. "Darkest Hour is a one man show for Oldman. And what a show it is." ​"Oldman brings a wicked wit and compassionate heart to the role, one for which he seems almost superhumanly suited for - and that's really saying something, consider how many great actors have played Churchill." 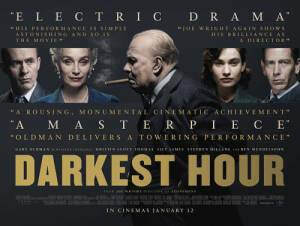 ​"Darkest Hour is entertaining and beautiful to watch."